We had some extra milk on hand this week, so I went digging for a chocolate pudding recipe that reminded me of the one mom used to make. The recipe below is adapted from the Chocolate Yummy recipe in “Favorite Recipes of America: Desserts“, published in 1968, which was one of my mom's favorite cookbooks. A little less sugar, a little more vanilla, and a different thickener, and we have a gluten free dessert that my youngest said he “could eat at least ten times in a row”. Heat 3 cups milk in double boiler or heavy bottom pot. Reserve one cup of milk. 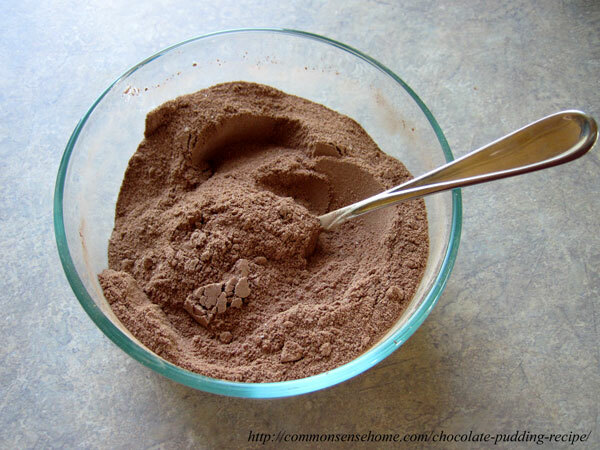 Mix dry ingredients together in bowl, whisking until thoroughly blended and all lumps are gone. *Note: These dry ingredients are all shelf stable, so you could make up your own pudding mix to have on hand for faster prep in the future. Whisk reserved cup of milk into dry ingredients until blended. 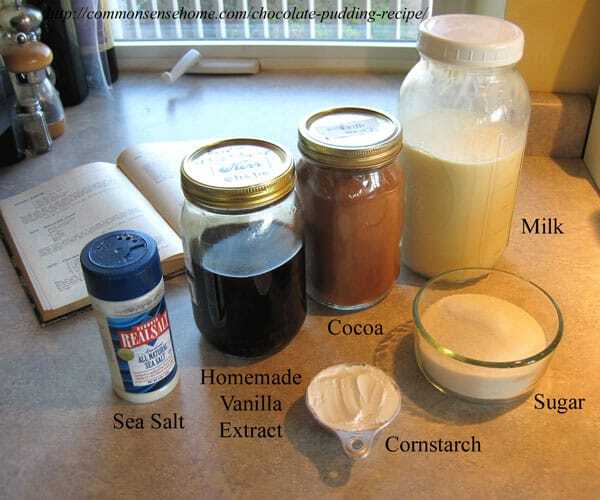 Pour chocolate mix into hot milk. Whisk to blend. At this point, it will look similar to hot chocolate. Cook until thickened, mixing frequently. If you're not sure how thick it should be when done, just watch the video below. Remove from heat and stir in vanilla extract. Pour into individual serving containers or large serving bowl. My personal choice of sugar is cane sugar, which is not yet genetically modified. Organic is great if you have it. If your granulated sugar doesn't say “cane sugar”, odds are that it's made from genetically modified sugar beets. Beet sugar also does not cook the same as cane sugar. Read “Sugar/Sugar: Cane and beet share the same chemistry but act differently in the kitchen” for more details. I also look for non-GMO cornstarch, and prefer grey sea salt or Real Salt over standard bleached table salt. I buy non-alkalized organic cocoa in bulk and repackage it into quart jars for storage. We also have some recipes that use no refined sugar and are gluten free. 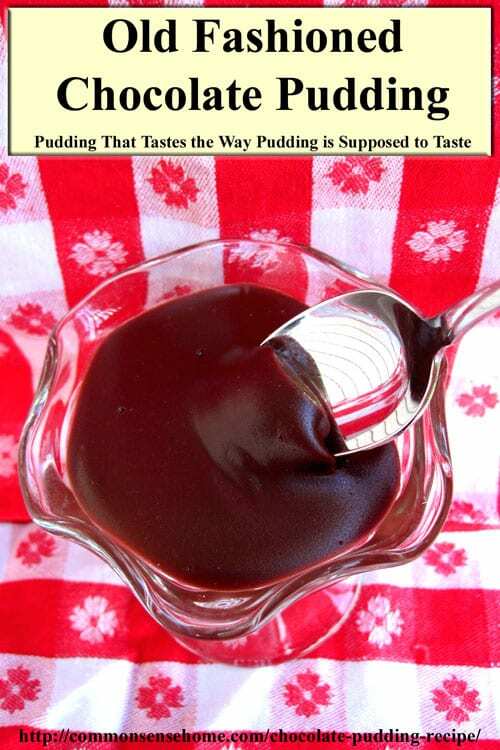 Pudding that tastes the way pudding is supposed to taste. 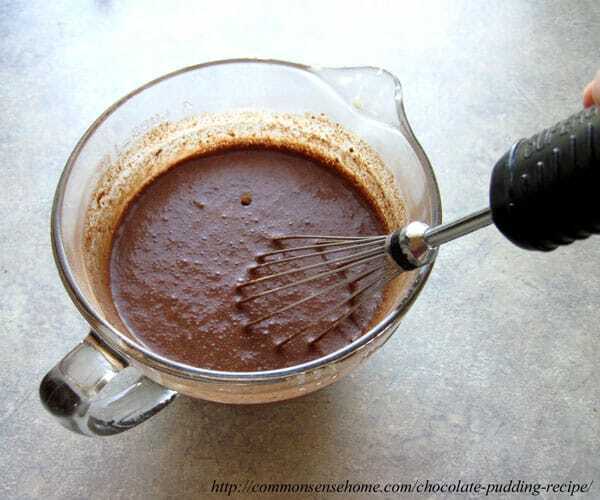 Mix dry ingredients together in bowl, whisking until thoroughly blended and all lumps are gone. Remove from heat and stir in vanilla extract. Pour into individual serving containers or large serving bowl. Eat warm or store in refrigerator. P.P.S. – Is there a favorite recipe you remember from years past that you'd like to see, or memory you'd like to share? Leave a comment below. Oops! Slice and serve as pudding bars? Absolutely! If you look closely, you can see it on the spoon in the bottom photo. Love the recipe, love the website, but I think there is some misinformation regarding beet sugar here. Beet Sugar… very little of beet sugar is GMO. Beet sugar was the sugar of choice by chefs. It became impossible to find when the Hawaiian sugar companies competed with them as it is much cheaper to refine Sugar Cane. Beet sugar is natural, awesome and full of extra trace elements you can’t get from sugar cane. It also doesn’t spike the insulin as much in the blood. I get slightly frustrated when the generic label is GM Beet Sugar is used as a way to deter people from using it. Most Beet Sugar isn’t GM. Homesteaders and naturalists who really do their homework and not listen to the fabricated lies regarding beet sugar (from the cane sugar competition, BTW) would not do this. Well, I’m not a “chef”, but my sugar of choice is cane sugar. Since it’s my website I suspect I’m allowed to have my opinion on such things. The photos in the linked story pretty clearly tell the difference between baking with cane and beet, so I’ll leave that for people to decide on their own. (Sugar Beets) account for 44 percent of U.S. sugar production. By this year’s (2010) spring planting, Monsanto’s patented GM seeds covered a jaw-dropping 95 percent of sugar beet fields. I agree with Laurie here. And I believe the sugar beets are actually higher now than it was in 2010. There was just a big expose on it and discussing the effect it is having not only on the insects but on the digestive systems of diabetic patients and those with auto-immune disorders. We’ve been specifically asked by our children’s pediatrician to limit any sugar beet use in our ADD child. More on correlation between Roundup use and cancer: “Monsanto’s Roundup Linked to Cancer – Again“. Homesteaders and naturalists who do their homework should know that roundup is not something we want on our food crops. I have no idea where you get your info from, Linda, but as of 2010 over 95% of beet sugar was GMO according to the USDA. Which means it had heavy loads of toxic chemicals added to it. http://m.huffpost.com/us/entry/2039455 is just one example. Laurie, can I use Splenda in place of the sugar? I wouldn’t consume Splenda in any form nor recommend it in recipes. You could try honey, and use half as much. Can you substitute arrowroot powder in for the cornstarch? If so, would it be 1:1? This article from FitDay suggests that an equal amount of rice or potato starch might work better, as arrowroot is not suggested for use with dairy. Laurie love this recipe and I’m so going to try this. 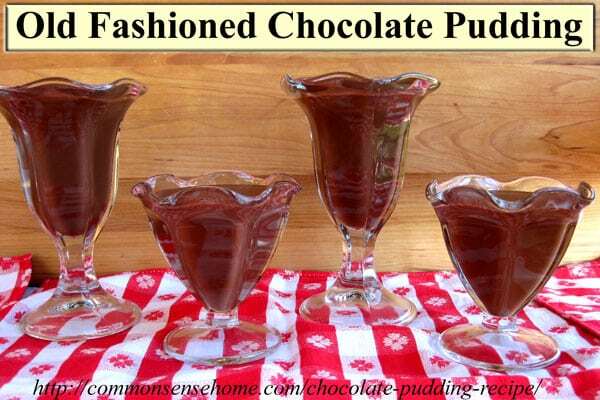 My husband loves chocolate pudding and this will be awesome. I love that one can mix up the dry ingredients ahead of time and store whenever needed. Here’s a good brown gravy recipe for you Laurie. Combine water and Beef base small saucepan. Heat beef broth in saucepan until steaming hot. Melt butter in medium saucepan over medium heat, add flour and onion powder whisk together. Allow to cook for 1 minute whisking occasionally. Add beef broth to flour mixture and whisk. Bring to boil, reduce to simmer for 1 minute. * Substitute Orrington Farms Chicken Broth Base to make chicken gravy also. Hi Laurie, I just made chocolate pudding from avocados and bananas for my developmentally delayed sister in order to limit sugar intake as it seems to set her behaviors off the scale. Of course, both of those ingredients are not sustainable here in Vermont, but then neither is cocoa. I guess it is good that it is a rare treat. I too love the skin on pudding. Greatpost. Sorry you lost your goodies but at least it was at the end. I was wondering, would almond milk work in this recipe or does homemade pudding only work with regular milk? Thank you. The texture might be a little different, but I think it would work. Could you do the pudding recipe in the microwave? I suppose it’s possible, but I don’t prefer to use the microwave for cooking. If you wanted to try it, I would heat in short bursts, stirring frequently, until it reaches the desired thickness. Wow, no eggs! and no butter either! 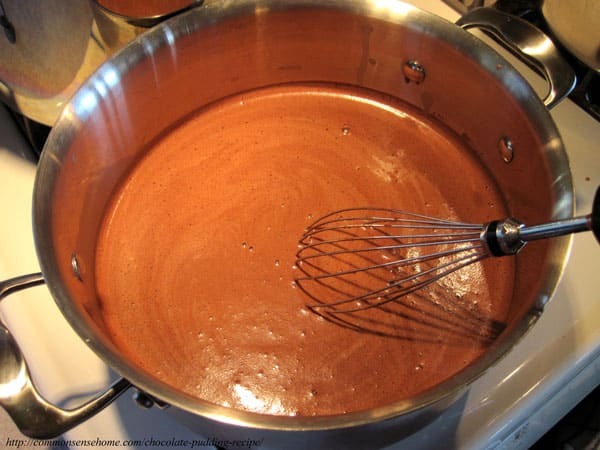 The scratch recipe my mom gave me uses both of those, for a wonderfully rich chocolate pudding. We usually use arrowroot though, why is it not recommended with dairy? The recipe that my mom used that included eggs and butter we referred to as a custard. I’m no arrowroot expert, but one of the sources I checked said that it might make the end product sticky when used with dairy. If you’ve found otherwise, please let me know. For the most part I’ve only used it baked recipes, not as a thickener. It does not make the end product sticky. I have been using your recipe since you published it, subbing arrowroot. My husband is allergic to corn, no cornstarch is used in my home. It produces a lovely result, just as if one used cornstarch. Thank you for letting me know, Debra. I’ll add that to the post. Sorry if I missed it, but how much should the milk be heated? Until hot, but not boiling. 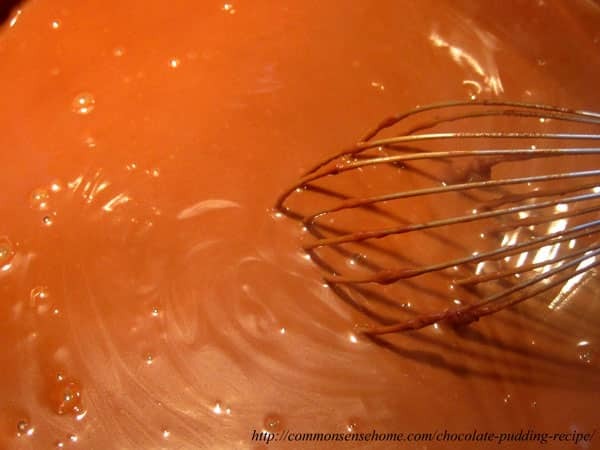 Cook on medium high heat, stirring constantly, after chocolate mix has been added, until thickened. Does it go in the fridge hot? Or does it cool off before it goes in? I usually let it cool a little so it doesn’t go in steamy. 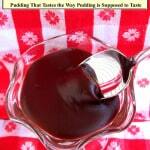 My mom used to make us kids homemade chocolate pudding this same way. I know exactly what you mean when you mentioned the “skin”! Great recipe.